Planting Native Daffodils – Dig Delve – An online magazine about gardens, landscape, growing & making. This year I have limited myself with the bulb orders as the newly landscaped ornamental garden is a year or so away from being ready for them. Bulbs are best placed where you know they can be left undisturbed so, in order for spring not to arrive without something new to look at, we have ordered a selection of tulips for cutting, a handful of Iris reticulata for pots and wild narcissus varieties to continue the ribbon that I am unravelling in stops and starts along the length of the stream at the bottom of the hill. I started the ribbon when we first arrived, and have been adding to it every year with a couple of hundred bulbs. But that quantity of bulbs runs for just a small stretch, even if spaced in groups that smatter and appear at random among the leaf mould. So last year I grew impatient and ordered 500 and I’ve done so again this year to make the ribbon go the distance. 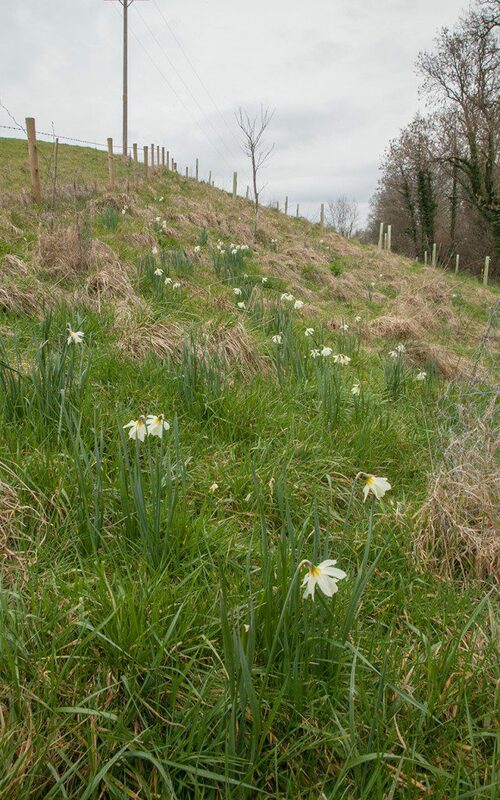 Our native Narcissus pseudonarcissus is most at home in open woodland where its young foliage can feast on early sunshine before the woodland canopy closes. I know them from Hampshire where they colonise hazel coppice on the lower slopes of the South Downs. Once they are established they clump densely, but the flowers rarely register as fiercely as the hosts of hybrid daffodils that you see littering parks in March. 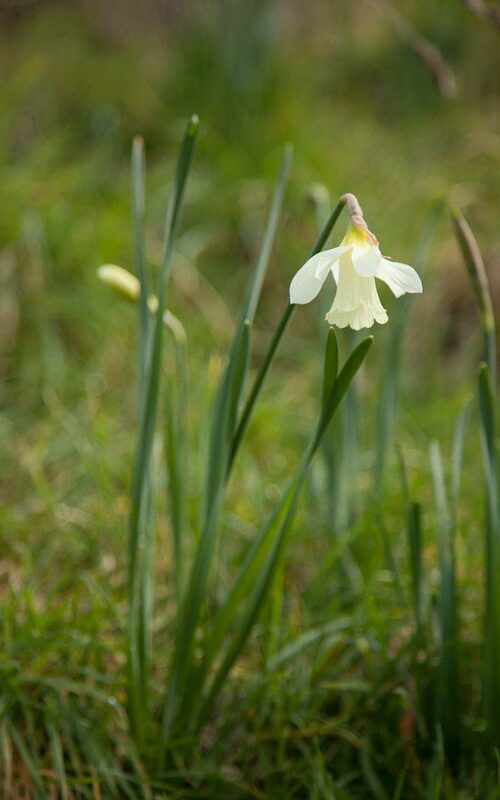 The wild daffodil is smaller in stature – just 30cm – and the flowers are fine, with twisting outer petals of pale primrose and only the trumpet a saturated gold. 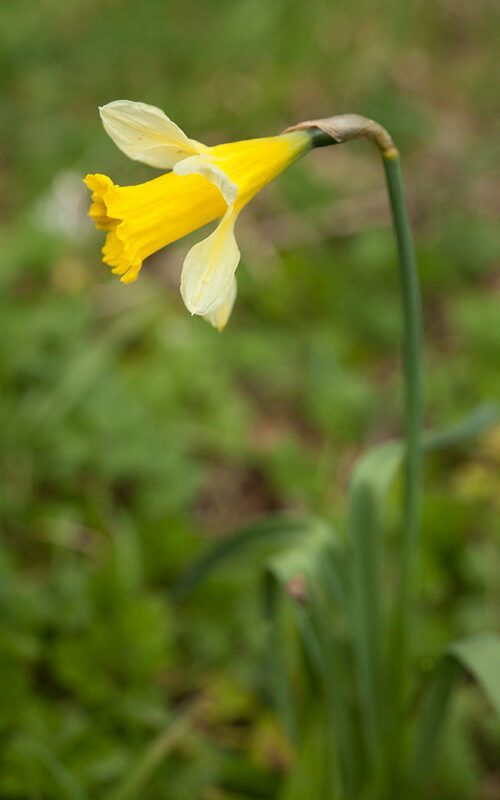 Unlike hybrid daffodils Narcissus pseudonarcissus is slower to establish and will often sulk for a couple of years before building up to a regular show of flower. No matter, it is worth the wait and I have already started my relay. 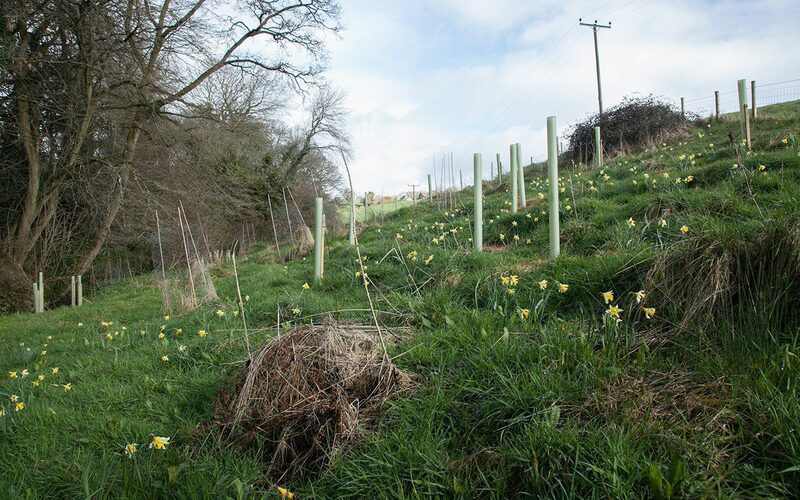 The fourth leg runs into the area on the lower slopes of The Tump where the ground is too heavy for wild flowers and too steep for hay making and where I have taken some of the field back to plant a coppice. The hazel and hornbeam are just saplings, but it is good to think of the narcissus getting their feet in ahead of the trees. 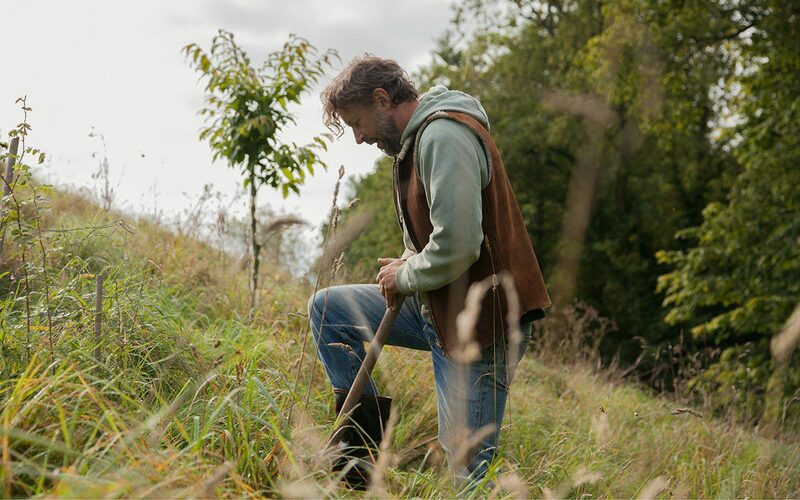 About three years ago my parents bought me a sweet chestnut for Christmas, which I planted alone in the coppice. It will be allowed to become a standalone tree to pool shade in the future and rise up above the rhythm of the coppice as it ages. Here I have started a drift of Narcissus pseudonarcissus ssp. moschatus, the white-flowered form of the native, which has been in cultivation since the 17th century. The elegant, downward-facing flowers are ivory as they open, fading slowly to a chalky white in all their parts. It is a beautiful thing and will be distinctive in the dim shade of the chestnut. I planted these bulbs as a memorial to my father who died the year the tree was planted and at the same time as the narcissus flower in late March. This variety is hard to find and this year I have only been able to source 50, but I am happy to add a small number annually. I like that it will take some time to come together and for the annual opportunity that this gives one to ruminate. The Tenby Daffodil, Narcissus pseudonarcissus ssp. obvallaris, is the final part of this autumn’s order. This brighter yellow flower is also a native and, as its common name suggests, is most commonly found in Wales and the west. I have bought just a hundred and plan to trial it in the sun on the banks at the top of the brook near the beehive. 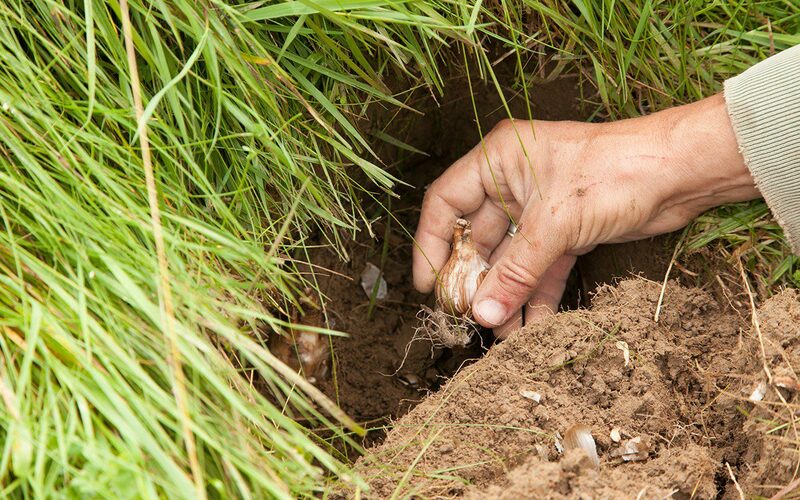 Knowing your daffodils before you put them into grass is really important, as once they are in they are a nightmare to try and remove if they are wrong. I want to be confident that they aren’t too bright for their position and flare garishly where they shouldn’t. This will be my first time growing them for myself, so I want to get it right. I am planting a little late this year as the wild daffodils prefer to be in the ground in August or September. They will be fine in the long run, but the green leaf tips are showing already and I can see that it would be better for them to be drawing upon new root rather than the sap of the bulb to produce this growth. 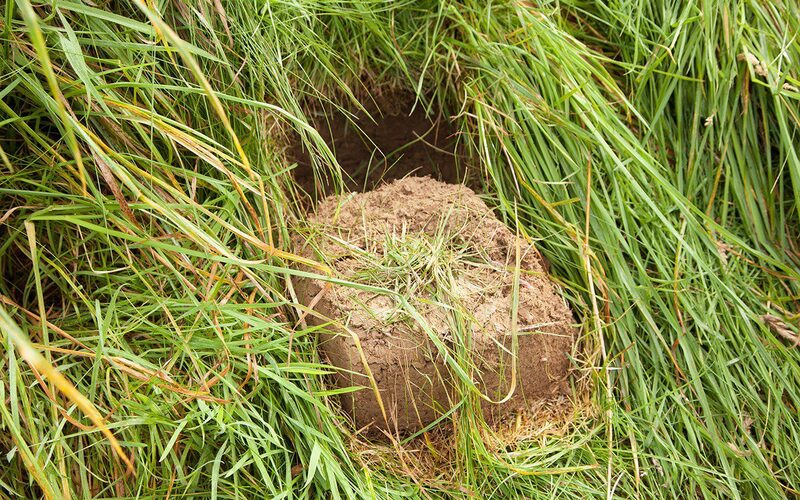 To plant I lift a square sod of turf by making three slits and then levering the sod on the hinge that remains uncut. I put the bulbs in three to five per hole and at two and a half to three times the depth of the bulb. The flap is kicked back into place and firmed gently with the foot to remove any air pockets. A moment or two stepping back and imagining the same scene on the other side of winter is a very satisfying way to finish the day.